The Follower Love hop is to thank all of my lovely followers and runs from 12:01 AM on Tuesday, February 8th to 11:59 PM on Sunday, February 13th. 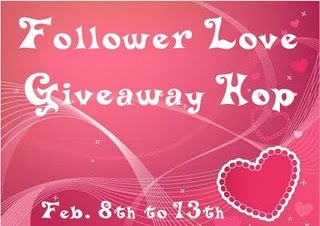 Each participating blog is hosting their own giveaway with their own entry requirements. All participating blogs are linked up through the Dreaming of Book’s linky HERE. After you have entered one giveaway hop go to the next giveaway on the list. There are actually four, but I can’t locate one right now. Thanks for the giveaway. This Hop is really keeping me busy today! Thanks for joining the giveaway hop. Once again, thanks for the great giveaway.